Not many know that Exeter finished the 1939-40 season unbeaten… What many will recognise however, is that these dates coincide with the outbreak of WWII, which led the Football League to suspend the competition with Exeter sitting in fourth place. While regional leagues were organised for the duration of the conflict, the board of directors decided that due to its distance from other footballing centres, Exeter City would close down until this state of emergency passed. The break from football changed the purpose of SJP, and during the war years the ground was used by both the Home Guard and the US military for training, with the latter proving so popular that the stadium was opened for the visiting public to come and watch. 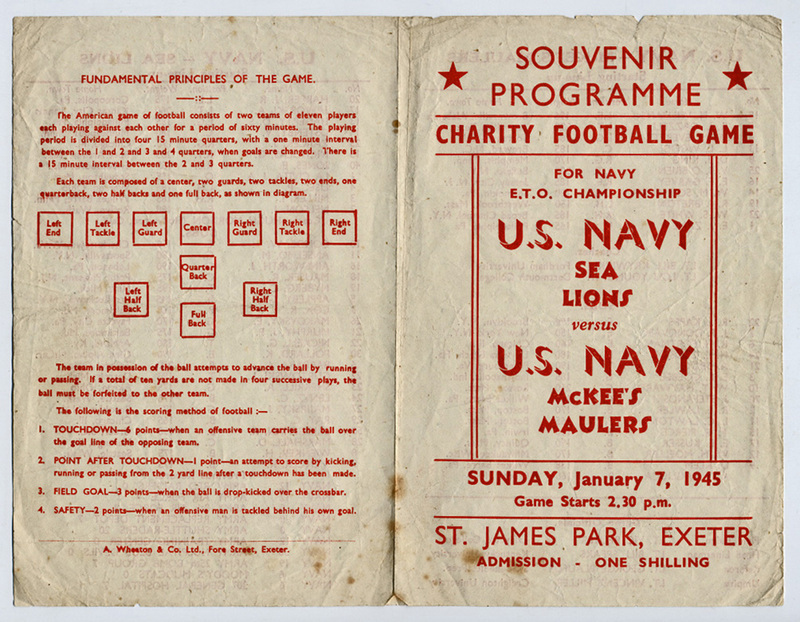 Sport would also feature, with the European Baseball Championship final being played here in 1945, as well as the above documented game of American Football, where the US Navy Sea Lions beat their fellow naval opponents, McKee's Maulers by 13 points to 6… A result which technically makes it the highest scoring game of ‘professional football’ ever to be played in our stadium!